Hardiness Zones 3 to 8, but does better further north. 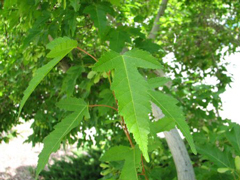 Native habitat Amur Maple was introduced in 1860 and is native to northern and central China as well as Manchuria and Japan. 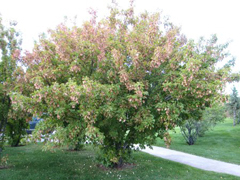 Growth habit and rate This multi-stemmed maple is variable in shape and is often found as a large shrub, but can also be a small tree. Through pruning, it can be shaped to suit specific needs. 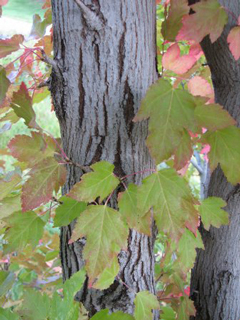 Amur Maple can grow up to 25 feet, but typically grows to 15 – 18 feet. Multi-stemmed specimens can grow as wide as they are tall. Foliage Often one of the first trees to leaf out in spring, Amur Maple has dark shinny green leaves with a light green underside. Leaves are variable in shape and have three lobes with the middle lobe usually longer than the side two. The doubly serrate leaves are 1-1/2 to 3 inches long. 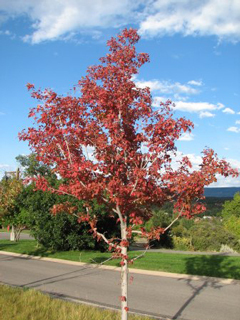 Amur Maple turns color early in fall and foliage does not remain on the plant for long. Leaves often turn a showy red but yellows can also be seen. There is a lot of variety in fall coloration, and it isn’t consistent, but color is best when it’s planted in full sun. Buds Reddish-brown, or lighter, buds are small (1/8 inch long) and waxy. Flowers Borne in small (1 tp 1-1/2 inch diameter) clusters, yellowish white flowers appear in April and May at about the same time as the leaves. 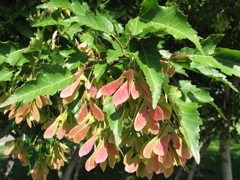 Amur Maple is one of the only maples with fragrant flowers. Fruit Reddish samaras are .75 – 1 inch long with wings that are almost parallel. Fruit remains on the tree through the winter. Bark Grayish-brown with darker vertical groves as it ages. Young bark is gray and smooth. Twigs Stems are gray-brown and thin with a waxy coating. Insects and diseases Generally free of pest and disease problems, but is susceptible to verticillium wilt. Landscape value Can be used for hedges or screening, in group plantings, or as a small specimen. Also does well planted in a container as a patio plant.